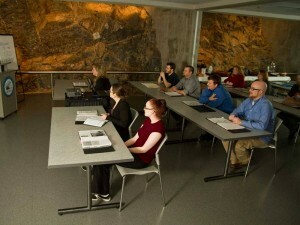 GEO CENTRE is a fresh setting for any meeting. Looking for a great meeting space? Look a little deeper. Meetings and special events happen every day for businesses and organizations in St. John’s. Christmas parties, annual meetings, strategic planning sessions, information seminars, training sessions… no matter what the event, they can set the tone for a new project, and even redefine how people feel about everything you do. When you plan such an occasion, it’s important to do it right. If you’ve been getting tired of the same old venues for meetings and conferences, the Johnson GEO CENTRE is the perfect solution, offering you the opportunity to hold your event in one of Canada’s most distinctive buildings. As soon as you enter the grounds of the GEO CENTRE on historic Signal Hill, you know you are somewhere special. Outside the striking, three-story-high, glass entrance, more than 100 free parking spaces welcome your guests. And once you step inside, you quickly discover that our spectacular 33,000 ft2 building is mostly underground, inside our 550 million-year-old, exposed rock walls of Signal Hill. VISA, MasterCard, and debit cards are accepted for all rentals.To book your next meeting, call Mike Daly at (709) 737-7883 or email him at mike.daly@geocentre.ca.We look forward to making your next meeting the most successful you have ever held!